In response, Trump has doubled down on appealing to his base. In recent days, he has once again referred to the potential rigging of the election and asked his supporters to volunteer to monitor voting locations for fraud. 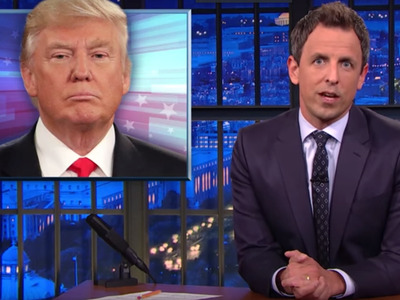 Meyers then pointed to Trump’s previous “birther” accusations that President Barack Obama wasn’t born in the US. Then there’s his threat during the debate that if he were to become president, Trump would have Clinton sent to prison. “That’s Trump’s M.O., to discredit anyone he disagrees with, whether it’s his opponent, or the election itself, and even the media,” Meyers said.